When Barb & I moved from Northern California to South Texas in 2001, we soon learned we had to be more careful with our patio wine drinking routine. We began to experience what so many others do- "Hey, there's a bug in my wine!" In my research I learned that the attraction of bugs and insects to wine was an ages old problem. There is even reference to it in scripture (Matthew 23:24). Anyway, we began improvising protection using things such as napkins, coffee filters and cd cases to cover our wine glasses, but nothing worked well. 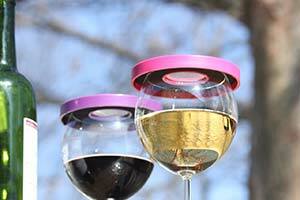 I made the first prototype of the wine glass protector from cut-out cardboard and fiberglass window screen. It wasn't pretty, but it worked. So the dream took off from there, and after much effort, engineering and refinement we offer you today's Wine-Tapa®. We believe it's attractive, subtle and effective. As one of our customers said, "Thanks for elegantly solving a rather miserable problem!" If you would like more information, please feel free to fill out our online contact form or call us at 1-888-646-0598 today! We look forward to hearing from you soon! 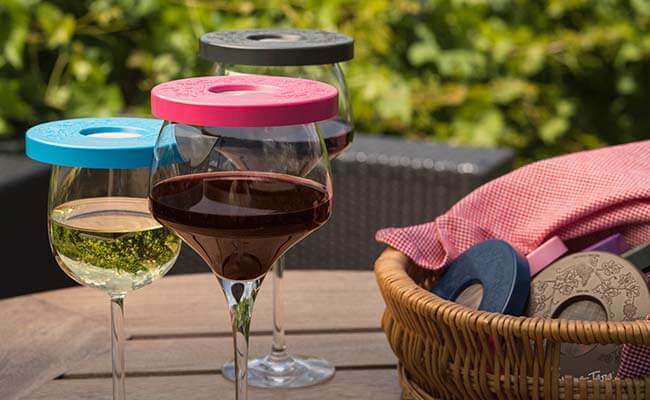 Protect against bugs in your wine! Please ask any questions you have about the Wine-Tapa® below. Thanks for filling out our form! We'll get back to you as soon as possible. Can you believe I ordered 10 of your wine glass covers last month for Christmas gifts, and gave them all out and don't have one for myself, so I had to order again so I could have one! Nice product!